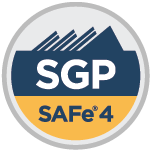 The SAFe for Government Course is a 2 day class from 9AM-5PM, a light breakfast is served at 8:30AM and Lunch is provided mid-day. This course is still in beta, its exam is not yet available. Taking this course will make you eligible to take the exam when it becomes available. Bring us onsite for a SAFe for Government private training for your team!